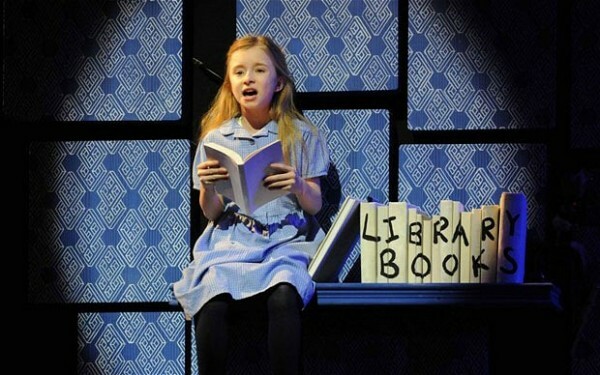 When you consider the elements that make Roald Dahl’s Matilda such a well-loved book – a smart lead who is far from a goody-goody, a monsterish villain (or three) and a touch of magic – it’s surprising that the Royal Shakespeare Company’s new version, with a book by Dennis Kelly and music and lyrics by comedian Tim Minchin, is its first musical adaptation. Before the action even starts you are absorbed by the impressive set, which comprises a flood of Scrabble tiles that tumble down from the rafters, bringing to mind 5-year-old Matilda’s passion for books and language – the same passion that means her headteacher Miss Trunchbull, and even her parents, the air-headed Mrs Wormwood and the cheating car-dealer Mr Wormwood, distrust and dislike her. From there, the staging is consistently bold and frequently truly dazzling. Having Trunchbull keep an eye on dozens of TV screens in her office (some showing her own hammer-throwing successes) gives her the feel of a deranged totalitarian, and set-pieces such as when she swings a little girl around by her pigtails are particularly well done – not to mention very, very funny. It is the opening scene from the second act that really sticks with you though, when the children ride on swings which are attached to the theatre roof and swing right out into the auditorium. A moment of genuine wonder, this scene is accompanied by one of comedian – and experienced musical composer – Minchin’s finest songs, ‘When I Grow Up’, which tugs at the heartstrings with its innocent, child’s-eye view of what adult life will be like (going to bed late every day and eating sweets on the way to work feature heavily). This is just one among many sublime songs however – lyrically complex and packed with instantly hummable melodies, the frankly faultless score is by turns funny, tender and clever. ‘Loud’, Mrs Wormwood’s paean to style over substance is a bombastic crowd-pleaser, and acts as a great counterweight to ‘Quiet’, which charts Matilda’s confusion and eventual calm as she discovers her telekinetic powers for the first time, and which was a highlight of a lovely, controlled performance from Adrianna Bertola as Matilda (Josie Griffiths and Kerry Ingram take the role on other nights). Minchin’s trademark ‘how did he ever think of that?’ moment comes in ‘The School Song’ – a track which contains a fantastic lyrical trick that I won’t give away, but had murmurs of admiration rumbling around the audience. Dahl aficionados will be anxious to learn how closely this musical sticks to the original novel, and thanks to the dark, twisted humour that Kelly and Minchin inject into the show, it is certainly much closer in both content and feel to the novel than the 90s film version without being slavish. Matilda’s ‘magic’ powers, for example, are here given the same importance as they are in the book (ie, not overwhelming) but on the other hand a whole new character is introduced in the form of Mrs Wormwood’s inappropriately bendy dance partner Rudolpho. The only possible issue is that Trunchbull – played by Bertie Carvel – is too funny to be truly scary. Carvel delivers a massive, consistently scene-stealing performance, but Trunchbull is certainly a figure of fun in this version and some will feel that she is not the terrifying grotesque that she could be. Moments of real menace do come from Paul Kaye as Mr Wormwood, however – and ultimately any child asked would say that a mean father is infinitely more upsetting than a mean headteacher. This production ticks a multitude of boxes – inventive staging, wonderful songs, humour and heart – and does it all in such a way that enchants the adults in the audience without ever alienating the very people that this novel, and musical, ultimately celebrates: children. A delight.